Portland, OR - Gaining clearance for up to 265/75/R16 tires couldn¹t be easier with Revtek¹s new lift system for the 2008 Jeep Liberty and ¹07-Œ08 Dodge Nitro. Consisting of billet aluminum 2-inch lift spacers front and 1-1/4 inch polyurethane spacers rear, this new system installs in under two hours with no cutting or welding required. 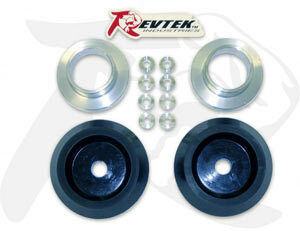 The system works within the OEM suspension geometry, and ride quality is completely unaffected.